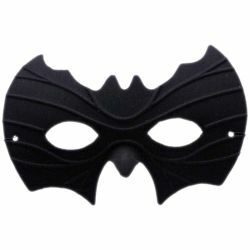 Black half mask in the shape of a bat. You can wear this mask on its own to a masquerade as is or decorate it to your liking so that it is unique to you. It can also be part of a Halloween costume when paired up with different accessories such as a super hero when you add a cape or a bat when you add wings. The mask is colored as pictured and is one size fits most using the attached elastic band.